Kawasaki rider Bryan Smith has been on fire as of late, winning the last three AMA Pro Flat Track races, including X Games Austin, where he was crowned the first-ever flat track gold medalist and Sammy Halbert tucked in behind Smith on his Kawasaki Ninja® 650 powered machine to take the silver medal, giving Kawasaki a 1-2 finish. Smith has made each race a nail biter as he has battled his Kawasaki Ninja 650 to the top spot of the podium in spectacular fashion winning at the one-mile tracks in Springfield and Sacramento this season. Watch for the No. 42 of Smith to try and make it four in a row as the AMA Pro Flat Tack series slides through Hagerstown Speedway in Maryland, Saturday, June 20th. 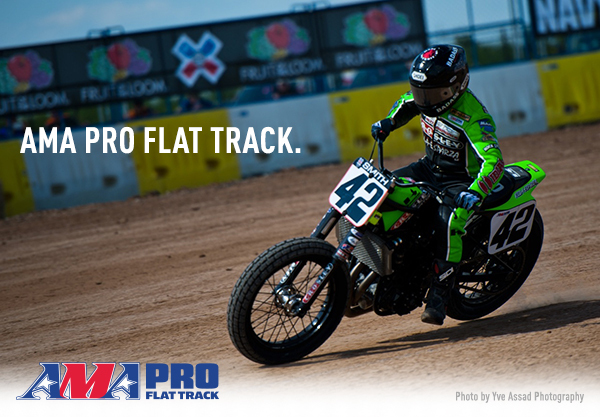 Recently Kawasaki re-entered AMA Pro Flat Track through its world-renowned contingency program for any racer running a Kawasaki, including a KX™450F in the singles competition. The racers asked and Kawasaki answered by posting more than $75,000 in contingency in the GNC1 class, offering racers rewards MasterCard that can be redeemed at more than 32 million locations worldwide and daily deposits into an online account after every competition.